Author generosity … book giveaway extended! Storms happen. Internet connections drop. Books aren’t scooped up for reasons we don’t understand … because … did you mean to enter the draw but forgot? If you wanted your own copy of the adult mystery thriller The Tipping Point by Walter Danley, but you missed the deadline, don’t be discouraged. Even though the giveaway dates have passed, Walter has generously offered a copy of his book to be given to YOU if you are among the first five persons to leave a comment. (click HEREto read about Walter) How generous is that! Five e-books being given away. Please don’t delay, leave your comment today! 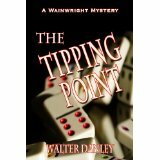 Walter will be happy to respond because he wants to give you an e-copy of his book – The Tipping Point – a thrilling crime story filled with mystery, action, suspense, and interesting characters. This entry was posted in Mostly About Reading, Reviews & Interviews and tagged adult fiction novel, author generosity, book giveaway, book giveaways, crime thriller, free book, suspense novel, The Tipping Point, thriller, Walter Danley. Bookmark the permalink. What an honor to have an author win a copy of my novel, The Tipping Point! And a Texas author to boot. (Pun intended) Yes, I like to know the folks that read my books, so I peeked in on FB and your blog. I was so pleased when Lynn asked me to do an interview with her. I hope that you enjoyed reading it as much as I did working with Lynn to do the thing. She worked diligently, and I think that shows in her questions. I hope that you will let me know what you think of the book, after you’ve had the chance to read it. Really, Beverly, I know I need not say this to a fellow writer, but “from the shoulder” would be your honest evaluation and that will be valuable to my craft. Enjoy it and stay in touch.